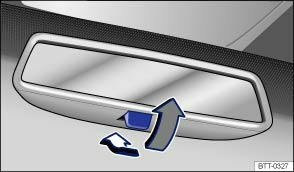 The driver must adjust the interior mirror to ensure clear visibility through the rear window. The driver’s rear view may be restricted or completely obscured by objects such as a sunblind on the rear window, items of clothing stowed on the luggage compartment cover, or a rear window that is covered in ice, snow or dirt. Sensor for determining light incidence from the rear. Sensor for determining light incidence from the front. The automatic anti-dazzle function is switched on and off using the switch in the interior mirror A ② or B ②. The indicator lamp A ① or B ① will light up when the automatic anti-dazzle function is switched on. One sensor on the side facing the interior to measure light incidence from the rear A ③ or B ③. One sensor on the side facing the windscreen to measure light incidence from the front C ④. When the ignition is switched on, the interior mirror will darken automatically according to the amount of light it receives. If the light on the sensors is hindered or interrupted, e.g. by a sunblind, the automatic anti-dazzle interior mirror will not function or will not function correctly. The automatic anti-dazzle function is deactivated when reverse gear is engaged or if an interior or reading light is switched on. Do not attach external navigation devices to the windscreen or near interior automatic anti-dazzle mirrors . Basic position: the lever on the lower part of the mirror is pointing towards the windscreen. Pull the lever to the back to select the anti-dazzle function . The illuminated display from an external navigation device can lead to functional impairment of the interior automatic anti-dazzle mirror and cause accidents or serious injuries. Impairments of the automatic anti-dazzle function may mean that the interior mirror cannot be used to precisely determine the distance from vehicles travelling behind or from other objects.